KATHMANDU, Jan 31: Even nearly three years since the 2015 devastating earthquake, only 57 houses have been reconstructed in Kathmandu Metropolitan City (KMC), where a total of 7,171 houses were damaged. The number of houses reported damaged in KMC was the highest among the local units in Kathmandu district. However, the reconstruction has been utterly slow. As a result, most of the victims in KMC have been forced to live in temporary shelters or move back into their damaged houses. In the core areas of KMC, the victims are still living in damaged houses buttressed with wooden spans and risking their lives. National Reconstruction Authority officials said many earthquake victims in KMC rebuilt their houses on their own due to the sluggish response on the part of KMC in reconstruction grant distribution. Likewise in Tarkeshwor and Dachhinkali Municipalities, not a single house damaged by the earthquake has been completed so far. The number of houses that need to be reconstructed in the two municipalities alone stands at 8,796. 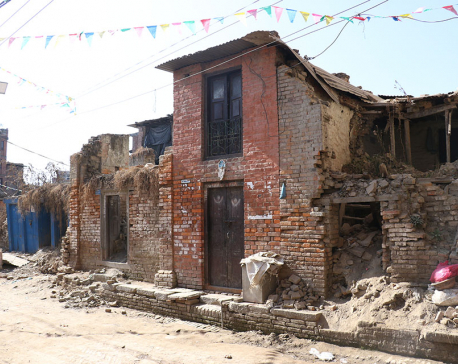 In Tarkeshwor, 5,465 houses were damaged while in Dachhinkali the number stands at 3,331. NRA records show that only 1,470 houses have been reconstructed so far in the 11 municipalities of Kathmandu district when the total number of houses needing to be rebuilt is 43,609. 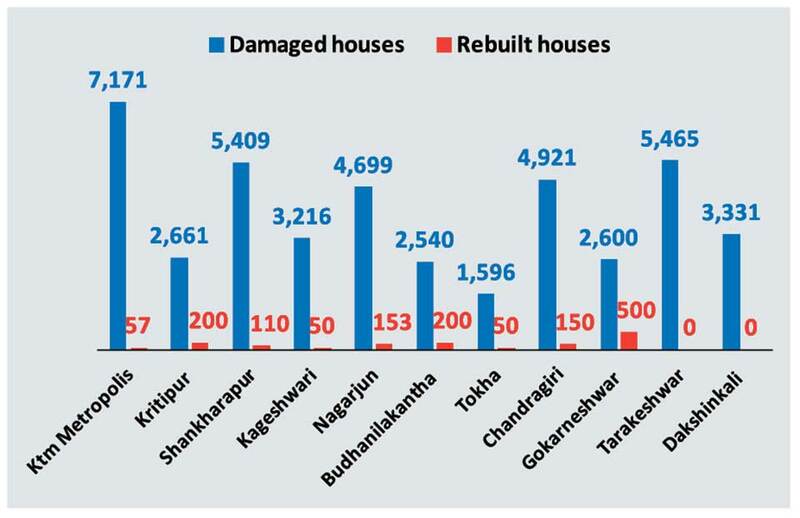 Of the 2,661 houses that need to be reconstructed in Kirtipur, only 200 have been constructed so far. Likewise in Shakharapur, only 110 houses have been reconstructed out of the 5,409 damaged by the earthquake. Similarly, in Kageshwori Manohara, only 50 houses have been constructed out of the 3,216 damaged. Only 153 houses have been rebuilt out of 4,699 damaged in Nagarjuna, 200 out of 2,540 damaged in Budhanilakantha, 50 houses out of 1,596 damaged in Tokha, 150 out of 4,921 in Chandragiri and 500 out of 2,600 damaged in Gokarneshwor. Instead of making efforts to resolve the problems and speed up the reconstruction work, officials of KMC, as well as other local units, are still making excuses about an insufficient number of engineers and construction workers, complications in the grant distribution process and land disputes, for the delay in the reconstruction. With the reconstruction moving at snail pace, NRA had summoned the heads of all the local units on Monday including KMC and grilled them about the delay. Asked about the delay by NRA CEO Bhusal, Deputy Mayor of KMC Hariprabha Khadgi said that KMC has been facing difficulties distributing the grants as most of the damaged houses are on land owned by the Guthi Corporation. NRA CEO Bhusal had expressed utter dissatisfaction over the delay. According to NRA sources, Bhusal criticized KMC and other local units for not cooperating with NRA to deploy engineers to the affected areas and speed up reconstruction.